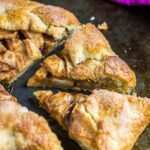 Homemade Apple Galette – A deliciously flaky, buttery pie crust filled with warm, spiced, tender apple slices. The ultimate comforting dessert! 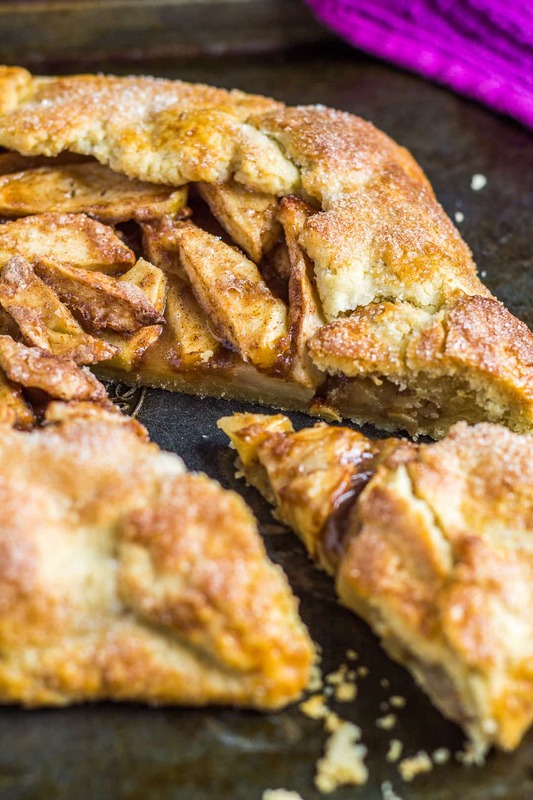 Are you an apple pie fan? Well, today I bring you an easier version – the lazy person’s pie. 😉 I bring you my recipe for Homemade Apple Galette! A galette is one layer of pie crust wrapped around a filling. Simple, yet impressive, and perfect for when you don’t have time to make a whole pie. 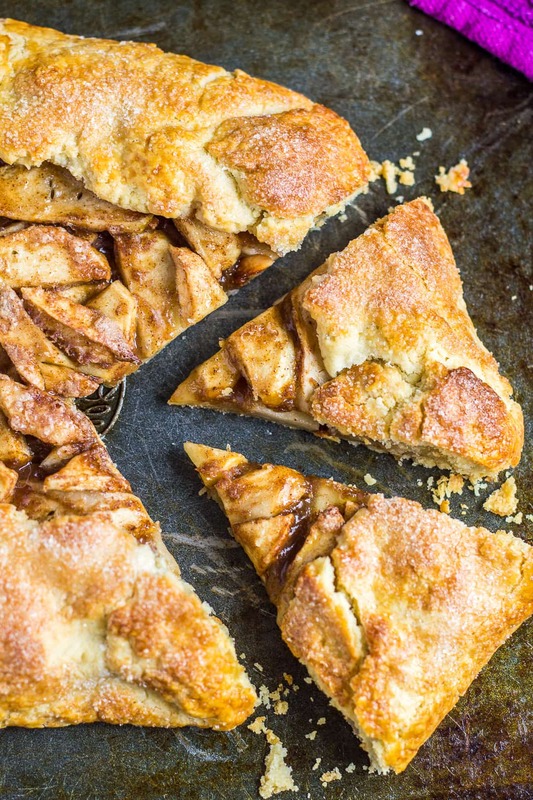 First, you’ll want to start off by making my Pie Crust recipe. You only need one crust, so halve the recipe, or freeze the second half. This pie crust is deliciously buttery, and so flaky – it’s my absolute favourite! For the filling, simply peel and slice up 2 – 3 large apples. Add to a mixing bowl, and combine with the sugar, flour, spices, and vanilla. Set the mixture aside whilst you preheat the oven, and roll out the dough. Once you’ve rolled out the dough, transfer to a baking tray, and arrange the coated apple slices in the centre of the crust. Fold the crust over the filling, sealing any overlaps. Brush the crust with a little egg wash, then sprinkle with some sugar. Aaaand it’s ready to bake! perfect enjoyed warm with a scoop of ice cream! How long will this apple galette last? This galette can be stored, covered tightly, in the fridge for up to 5 days. 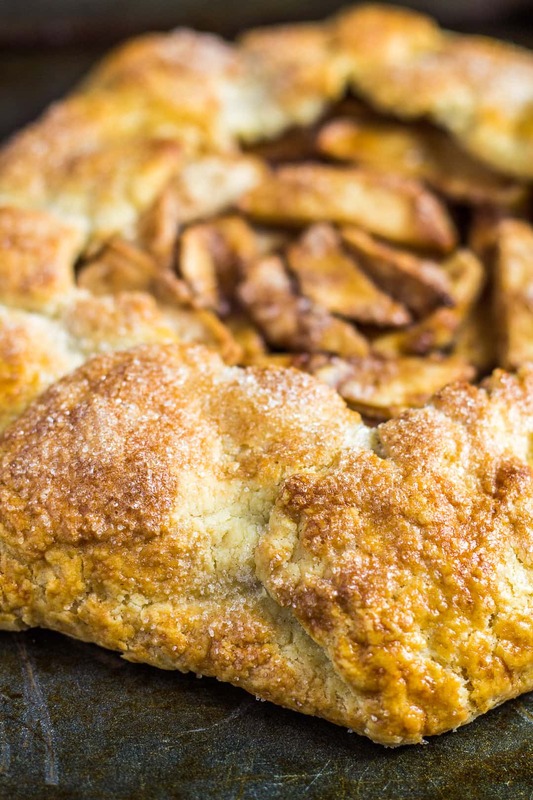 Can I freeze this apple galette? Yes, it also freezes well for up to 3 months. Thaw overnight in the fridge, and serve warm. Check out these apple recipes next! 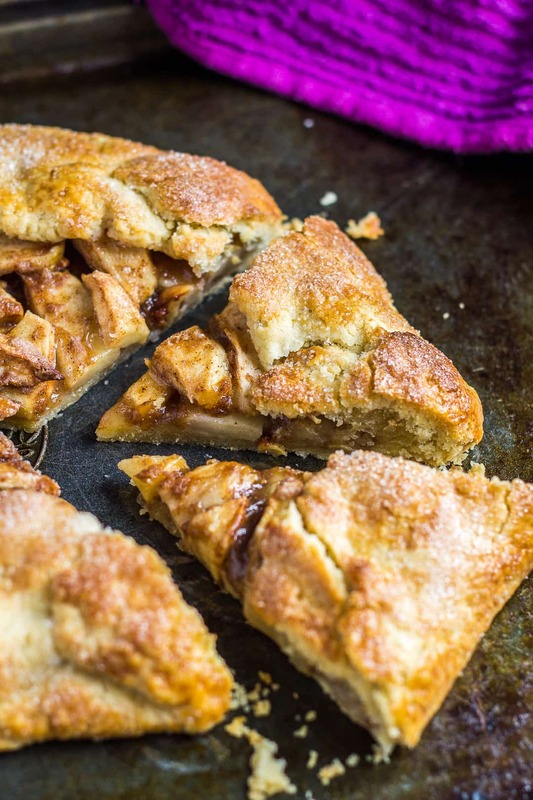 A deliciously flaky, buttery pie crust filled with warm, spiced tender apple slices! Prepare my pie crust recipe through to step 3. In a large bowl, mix together the apple slices, sugar, flour, spices, and vanilla. Cover tightly and set aside. On a lightly floured surface, roll out the disc of dough to a 12-inch circle. Transfer to a baking tray lined with parchment paper or a silicone mat. 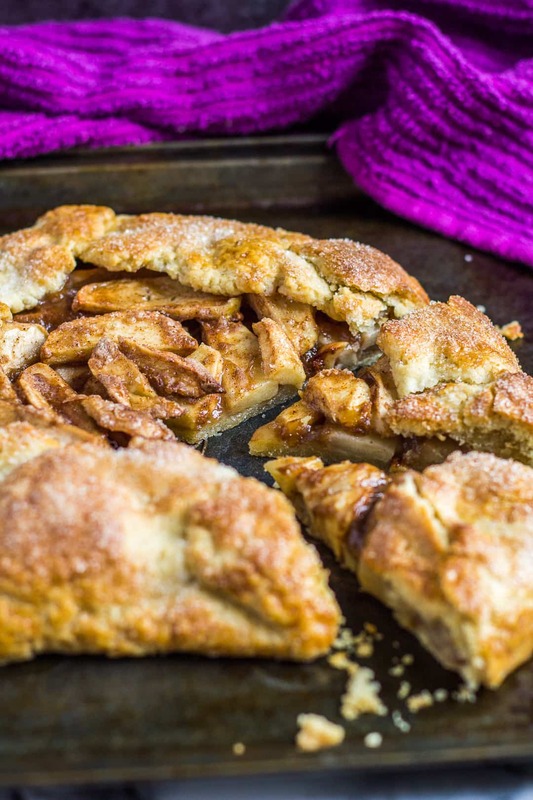 Arrange the apple slices (discard the juices) in the centre of the dough, leaving a 2 - 3-inch border around them. Fold the edges of the dough over the apples, gently sealing any overlaps. Brush the crust with the egg wash, and sprinkle with sugar. Bake for 35 - 45 minutes or until the filling is tender and bubbling, and the crust is golden brown. Allow to cool for about 10 minutes on the baking tray before slicing. Serve warm or at room temperature. Leftovers can be stored, covered tightly, in the fridge for up to 5 days. Baked galette freezes well for up to 3 months. Thaw overnight in the fridge. Serve warm. Both the dough and filling can be made ahead of time, covered tightly and refrigerated for up to 3 days. I love making galette because it is so easy to put together! Didn’t know you can freeze it once it has been baked – so thanks for the info! 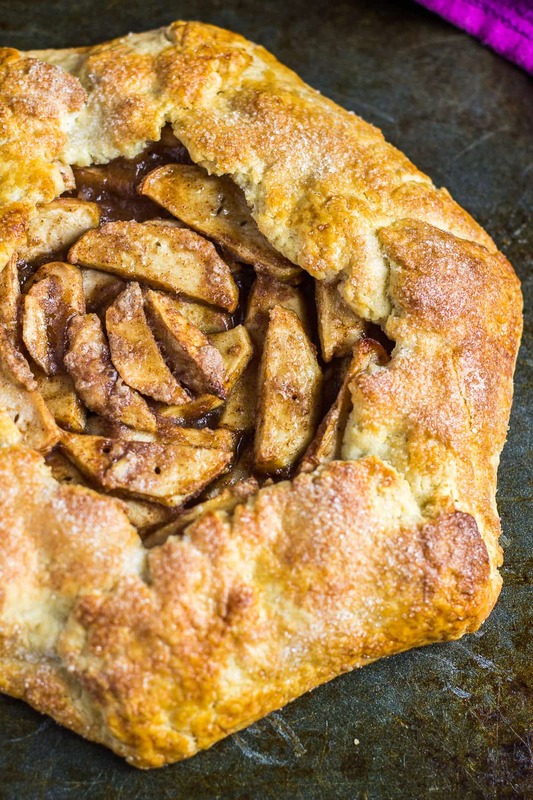 I’ve been dying to make a galette and this one looks beautiful! Beautiful Autumn flavours, this looks to die for! This looks like the perfect fall dessert! I love that you use a homemade crust. I’m SO excited for apple season, I’ve got a little pile of them on my counter now waiting to be used in something delicious, and I think I just found it! This is one of those times I wish someone has invented a way for us to smell something through a screen! Yummy! This looks absolutely delicious! What a beautiful galette! Seriously just the perfect dessert for transitioning us from summer to fall. Nothing better than a tasty transition right? 😉 Such wonderful photos, Marsha! I’m drooling. Pinned! Hope you and your family have a fantastic week! Thanks, Demeter! 🙂 You too!